Rome, Academie de France a Rome, Villa Medicis, from 10 July to 20 September 2009. The palace built by Ferdinando de Medicis on the Pincio hill has always been admired by travelers, usually from outside, only able to take in the imposing and martial-like façade. Exceptionally, this cultural fortress has now opened its doors to the public for the exhibition Villa aperta, which attempts to shed light on the history and heritage of the Villa Medicis and the Academie de France in Rome. Besides the exhibition, guided tours, along with a selection of rich musical and film offerings, invite visitors to rooms which are normally off limits, such as the director’s apartment (ill. 1 ; open to the public for the first time) or the painted galleries on the first floor, decorated b Jacopo Zucchi, and which today welcome prestigious guests staying in the Eternal City. Villa aperta however is more than just an exceptional “opening”. By tracing the beginnings of this emblematic place, the exhibition highlights the Villa itself, its ongoing dialogue with the Urbs, thus presenting some of the most revealing moments of its long history. The project started out ambitiously. 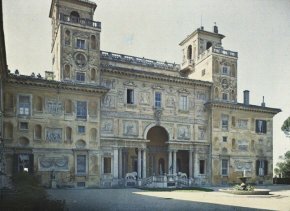 Organizing an exhibition about the Villa and the Academie de France in Rome posed a basic problem : how to talk about the heritage of one of the most beautiful palaces in Rome, since its contents were emptied at the end of the 18th century when the collections were expedited to France ? how to evoke the history of an institution whose vocation implies the absence of any works as the production of the artists-in-residence was always sent back to Paris ? Neville Rowley, 2008/2009 art historian-in-residence and curator of the exhibition (with the help of Helene Vuillermet) did not choose to focus utopically in an exhaustive manner on this heritage but rather, and more intelligently, presents the Villa as a place of permanent dialogue and creativity, still alive, not petrified by its patrimony. The accent is on the Villa as fostering artists, a source of nourishment where they are welcomed in passing and where they find inspiration, with its almost hypnotic aura as proven by a selection of works by former as well as current artists-in-residence, continuously refashioning and reinterpreting over the centuries the palace, the garden and the people who live there. In a perfect balance which includes all of the different parts of the Villa, the exhibition encourages visitors to wander inside its walls, from the cistern to the music salon, and to discover the garden’s most interesting spots (ill. 2) from the “bosco” to the Niobides square. The bosco workshop, which in 1933 welcomed a short-lived Musee de la Villa Medicis  and later the Balthus atelier , presents landscapes by Ernest Boulanger, as well as works by musicians-in-residence such as Georges Bizet (Grand Prix 1857), Jules Mansart (Grand Prix 1863) and Claude Debussy (Grand Prix 1884). The creation of the Grand Prix of Musical Composition dates back to 1803 when the Academie de France first came to the Villa Medicis. 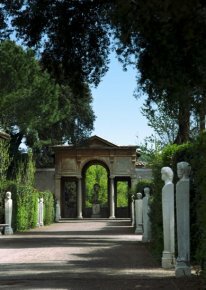 Along the Aurelian Wall, which today overlooks the muro torto, the expressway separating the Villa’s gardens from those of the neighboring Villa Borghese, there are the stanza degli ucelli and the stanza dell’Aurora, fresco paintings by Jacopo Zucchi and his workshop in 1576-1577. Nicknamed the studiolo by Ferdinando de Medicis, the stanza dell’Aurora was more likely a place of amorous rendez-vous for the cardinal, as suggested also by the stairway in the adjoining room leading to a discreet door at the bottom of the tower. 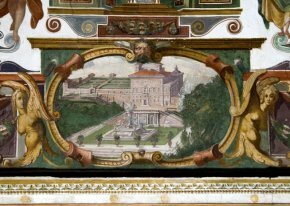 In any case, the grotesque decors represent not only a magnificent example of Mannerist style but are also an exceptional illustration of the Villa’s history : indeed, Zucchi painted three different views of the palace on the walls ; these are half-real and half-imaginary (ill. 3), thus documenting three stages of the construction. There is the project for the fountain and the staircase, never carried out, on the façade looking out over the city, as well as, on the right, a view of the palace before the Gallery was built. In the stanza degli ucelli, the installation by Anne and Patrick Poirier, artists-in-residence from 1968 to 1971, entitled The Labyrinth of Memory (2007), constitutes a perfect symbiosis between contemporary art and patrimony. It is made of a series of mirrors presenting words linked to different memories associated with Zucchi’s images, reflected infinitely on a structure which seems to have been built especially for this space. In fact, this was not the case as the Zucchi’s frescoes were still covered over by a layer of paint when the artists were living there. A little bit further, at the end of the path, former workshops now house a collection of casts. These appear against an elegant Wedgewood blue backdrop, in a classical and understated staging, allowing for an excellent appreciation of these very traditionally academic works. Valuable casts of Trajan’s column from the late 17th century cover the side walls. An imposing and controversial statue of Louis XVIII in his coronation costume, by Cortot between 1815 and 1817 can be seen at the back of the room. Reflecting the essential role they played in academic tradition, and the revived interest in these collections in the last few years, the gypsotheque allows visitors to rediscover some pieces which had been abandoned for too long in the Villa’s basement . Most of the works in the exhibition however are shown in the galleries where the first section is devoted to the visual myth of the Villa. The Villa is first of all a façade, visible from any point in the capital, an affirmation of the Medicis’ power over the papal city. Artists have represented it mostly from the square of Trinita del Monte, as for example in the Lateral View by Van Wittel (1683). Here, next to several plates of Victor Blanchard’s great work, Grand Prix d’architecture in 1833, The Villa Medicis in Rome, Drawn, Measured, Published and Accompanied by a Historical and Explanatory Text (1847), a series of interesting modern editions after the 1921 autochromatic plaque, by Auguste Leon (ill. 5), a photographer who worked for Albert Kahn starting in 1909, illustrating views of the entrance, façade and Loggia. Although some viewpoints are the same over the centuries, others have adopted more original angles, such as Gustave Caillebotte, who did a View of the Piazzale from the Front Steps (around 1872) and William Laparre, who transformed the garden into an eery place, lit surrealistically, in the splendid View of the Villa Medicis, Reflected Shadow in the Moonlight (1900). The next room evokes the photographic and televised representations of the Villa, illustrating the rapport between the classical images of the palace and the more modern technical reinterpretations. The Villa’s myth cannot be reinvented, it is deconstructed and then reconstructed at each period, as shown in a photograph by Pierre Leguillon, taken in 2003 from a hot air balloon in the park at the Villa Borghese, reproducing almost identically the Partial View from the Gardens with the East Façade of the Main Building (1620) attributed to Matthieu Greuter. Portraits of the artists-in-residence hang on both sides of the staircase, a collection of faces and personalities who wrote the history of the Academie de France in Rome. This series, which in the 1950’s hung in one of the workshops, offers the exhibition’s most anecdotal, but also most human aspect. Next to them, there are the busts of the directors, produced by different sculptors-in-residence, according to the tradition. This practice, as well as that of the portraits of the artists, was unfortunately discontinued with the arrival of Jacques Ibert in 1937 . Across from them, the Red Self-portrait (2003) by Yan Pei-Ming, in residence from 1993 to 1994, is in violent contrast with the rest of the series, while still renewing the lost custom. The last rooms present works in the pure academic tradition thus ending with a return to the order of things, reflecting in fact the institution’s crisis in the 20th century. However, the Villa remains a magnet for the generations of artists who arrive there and who continue to renew its myth or reconstruct, with irony, its workings. A portrait of the artists-in-residence of The Class of 1926 by Odette Pauvert, the first woman to obtain the Grand Prix in 1925, seems to be a response to the Group of Five Scholars (around 1908) painted twenty years earlier by Georges Leroux, clearly illustrating that despite the difference in style, there is a spirit of continuity which operates during the stay at the Villa. Two publications accompany the exhibition itself, with fine illustrations : a brochure (regrettably thin) focuses on the temporary exhibition, while a second, and independent publication, volume containing texts of former artists-in-residence and treating various aspects of the historical and architectural heritage of the Villa Medicis serves actually as a guide to Villa Aperta. Helene Vuillermetm “Parcours de visite”, Villa Medicis, Academie de France a Rome-Villa Medici and Mondadori Electa, Milan, 2009, p. 33. Balthus was director of the Academie de France in Rome from 1961 to 1977. 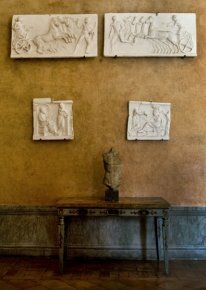 The plaster cast collections at the Villa were studied by Christiane Pinatel. See for example : “Les envois de moulages antiques a l’Ecole des Beaux-Arts par l’Academie de France a Rome”, in Henri Lavagne and Francois Queyrel (eds. ), Les moulages de sculptures antiques et l’histoire de l’archeologie, proceedings of the colloquium (Paris, 24 October 1997), Droz, Geneva 2000, pp. 75-120. Neville Rowley, Villa aperta, Academie de France a Rome-Villa Medici and Mondadori Electa, Milan, 2009, p. 25.